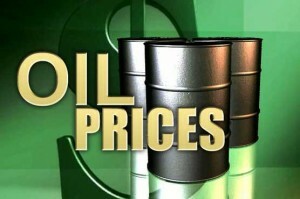 BANGKOK (AP) — The price of oil fell below $94 a barrel Thursday after a survey showed crude inventories on the increase.Benchmark oil for June delivery was down 38 cents to $93.92 a barrel at midday Bangkok time in electronic trading on the New York Mercantile Exchange. The contract rose 9 cents to finish at $94.30 a barrel on the Nymex on Wednesday. A report released by the American Petroleum Institute said U.S. crude supplies for the week ending May 10 rose 181,000 barrels to 390.2 million from the prior week. Ample supplies and predictions of tepid global growth have kept crude prices muted. The outlook for the global economy took a punch Wednesday with the release of data showing Germany, while avoiding recession in the first three months of the year, grew a mere 0.1 percent. Traders had expected to see a 0.3 percent expansion of Europe’s biggest economy.”With recovery optimists so dependent on the occasional glimpse of sunlight from Germany, their miss was particularly disappointing,” said Toby Morris, senior sales trader at CMC Markets, in an email commentary. Brent crude, a benchmark for many international oil varieties, fell 32 cents to $103.18 a barrel on the ICE Futures exchange in London. — Wholesale gasoline fell 0.4 cent to $2.844 a gallon. — Heating oil fell 1 cent to $2.87 a gallon. — Natural gas lost 0.1 cent to $4.069 per 1,000 cubic feet.